What are these and how did they get here? Making your studios better, one nut (and four bands) at a time. There are only a handful of certainties in life. Death. Taxes. Broken suspension bands on your RE20. That’s how Better Bands got started. After repeatedly seeing our beloved microphones held by a fraction of a millimeter of rubber before the inevitable re-banding… we knew there had to be a better way. We are Fred Bennett and Shawn Tempesta, two people working in the radio industry with a collective 30 years experience. What if we could make bands that lasted longer, were stronger, and didn’t need replacing in mere months? Specially formulated silicone that balances strength and stretch. 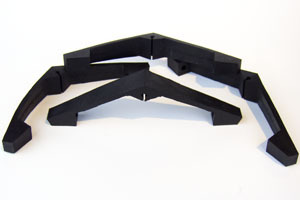 Custom designed bands made with nearly double the material of OEM bands, with none of the typical weak points. Last longer, which gives you more time to do your job. We got to work sketching superior designs, until eventually landing on a “stealth fighter” design that features superior material and design, with none of the typical weak spots of OEM bands. After working with our supplier, we created a specially formulated silicone that has the perfect blend of stretch and strength. While our first batch worked – it smelled. A lot. Like a substance that is still illegal in many states. Our second attempt? Gold. Our bands have been in testing in real-world studios for several months, without the signs of weakness we see in the typical band. Since the creation of the band, we kept staring at these legendary microphones and figured out the other weak point of the product: the nut. Meant to hold the mount to the boom, many talent (used lightly) have had a moment with the microphone falling from the boom and “going boom” onto the board. The threads and the screw… far too short to get a meaningful hold. Steel, not brass, making more a more resilient design. Hex nut allowing for a sure-fit on your boom. Allen bolt with thumb screw cap to allow for a sure-fit to your mount. That got us immediately working on Better Nuts. 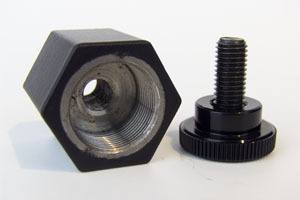 Better Nuts are made of 100% steel, stronger than the OEM’s brass nuts. With more threads and a hex design to tighten it securely to your boom, and an Allen bolt with a thumb cap to ensure a tight fit. Simply put, your microphone has never been more secure. With Better Bands and Better Nuts, we have re-designed one of the most used pieces of your studio. That means less replacing broken equipment, giving you more time to fix the other stuff your talent breaks.